Altitude sickness refers to a spectrum of illnesses related to hypoxia occurring in people rapidly ascending to high altitudes. The three types of altitude sickness are acute mountain sickness, high-altitude pulmonary edema, and high-altitude cerebral edema. AMS describes malaise, nausea, headache and lassitude and affects the majority of people for a few days above 3500 m. Following arrival at this altitude there is usually a latent interval of 6-36 hours before symptoms begin. Treatment is rest, with analgesics if necessary. Recovery is usually spontaneous over several days. Prophylactic treatment with acetazolamide, a carbonic anhydrase inhibitor and a respiratory stimulant, is of some value in preventing AMS. Acclimatizing, i.e. ascending gradually, provides better, and more natural prophylaxis. In the minority, more serious sequelae - high-altitude pulmonary oedema and high-altitude cerebral oedema develop. Predisposing factors include youth, rapidity of ascent, heavy exertion and severe AMS. Breathlessness, occasionally with frothy blood-stained sputum, indicates established oedema. Unless treated rapidly this leads to cardiorespiratory failure and death. Milder forms are common. Breathlessness at rest should raise the suspicion of pulmonary oedema. Cerebral oedema is the result of abrupt increase in cerebral blood flow that occurs even at modest altitudes of 3500-4000 m. It is unusual below 4500 m, and usually occurs in the first two weeks, during acclimatization. Cerebral oedema can also develop suddenly in well-acclimatized climbers above 7000 m. Headache is typical, and is accompanied by drowsiness, ataxia and papilloedema. Coma and death follow if brain oedema progresses. Any but the milder forms of AMS require urgent treatment. Oxygen should be given by mask if available, and descent to a lower altitude should take place as quickly as possible. Nifedipine reduces pulmonary hypertension and is used in the treatment of pulmonary oedema. Dexamethasone is effective in reducing brain oedema. Portable pressure bags inflated by a foot pump are widely used; the patient is enclosed in the pressure bag. Small ‘flame’ haemorrhages within the retinal nerve fibre layer are common above 5000 m and usually symptomless. Rarely a haemorrhage will cover the macula, causing painless loss of central vision. Recovery is usual. Prolonged residence between 6000 and 7000 m leads to weight loss, anorexia and listlessness after several weeks. Above 7500 m, the effects of deterioration become apparent more rapidly over several days, although it is possible to survive for a week or more at altitudes near 8000 m without supplementary oxygen. Chronic mountain sickness occurs in long-term residents at high altitudes, usually after several decades and is seen in the Andes and in central Asia. Headache, polycythaemia, lassitude, cyanosis, finger clubbing, congested cheeks and ear lobes, and right ventricular enlargement develop. Chronic mountain sickness is gradually progressive. By contrast, coronary artery disease and hypertension are rare in high-altitude native populations. • Over 30 million people are at risk of developing altitude sickness. • In Summit County, Colorado, the incidence of acute mountain sickness was 22% at altitudes of 1850 to 2750 m (7000 to 9000 ft) and 42% at altitudes of 3000 m (10,000 ft). • Approximately 0.01% of tourists to Colorado ski resorts experience HAPE or HACE. • Men are 5 times more likely to develop HAPE than women. • AMS and HACE affect men and women equally. • As one ascends to altitudes above sea level, the atmospheric pressure decreases. Although the percentage of oxygen in the air remains the same, the partial pressure of oxygen decreases with altitude. • Thus the cause of altitude sickness is primarily hypoxia resulting from low partial pressures of oxygen. • The body responds to low oxygen partial pressures through a process of acclimitization (see “Comments”). 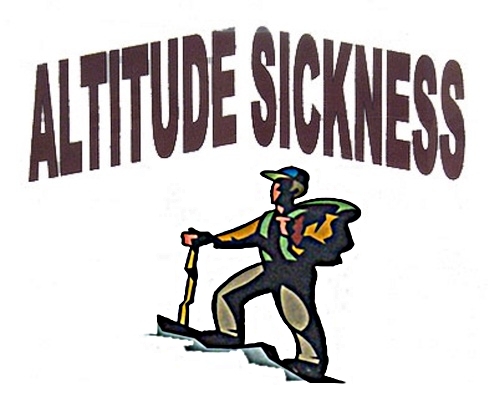 The diagnosis of altitude sickness is made by clinical presentation and physical findings described above. Typically the diagnosis is self-evident after history and physical examination. Laboratory tests and imaging studies help monitor cardiopulmonary and CNS status in patients admitted to the intensive care unit for pulmonary and/or cerebral edema. Laboratory tests are not very useful in diagnosing altitude sickness. • Stop the ascent to allow acclimatization or start to descend until symptoms have resolved. • Oxygen 4 to 6 L/min is used for severe AMS, HAPE, and HACE. • Portable hyperbaric bags are useful if available at the site. • Aspirin 325 mg PO q6h can be used for headaches in AMS. • Acetazolamide 125 mg to 250 mg PO bid is used in patients with AMS and HAPE. • Nifedipine 10 mg sublingual followed by long-acting nifedipine 30 mg bid is used for patients with HAPE who cannot descend immediately. • Dexamethasone 4 mg PO is used in patients with severe AMS, HAPE, and HACE. • Prevention therapy is the most prudent therapy. 1. Slow staged ascent to avoid altitude sickness. 2. Start the ascent below 8000 feet. 3. Ascend 1000 ft/day and rest. 4. Spend two nights at the same altitude every 3 days. 5. Sleep at lower heights than the altitude climbed (“climb high, sleep low”). 6. Prophylactic inhalation of a ?-adrenergic agonist, salmeterol reduces the risk of HAPE in susceptible individuals. • AMS improves over a period of 2 to 3 days. • HAPE is the most common cause of death among the altitude illnesses. • More than 60% of patients with HAPE will have recurrence of symptoms on subsequent climbs. • Neurologic deficits may persist for weeks but eventually resolve. If coma occurs, prognosis is poor. Cardiology and neurology referrals are made in patients with pulmonary edema and CNS findings respectively. • Physical fitness is not protective against high-altitude illness. • HAPE is characterized by elevated pulmonary pressures resulting in a protein-rich, hemorrhagic exudates into the lung alveoli.